$650.00 Stalin, large size bust in cast iron, Kasli Iron Works, dated 1946. By Pavel Anikin. Rare and impressive early piece. The bust has been professionally repainted but is in otherwise excellent condition, free of noticeable rust, dents or other damage of any kind. $750.00 Stalin's Bust in glazed porcelain by the famous Lomonosovskiy Porcelain Factory in Leningrad (LFZ), mid 1940s - mid 1950s. By the renowned sculptors Ingal and Bagolyubov, famous for their portraits of both Stalin and Lenin. In outstanding condition. $340.00 Stalin Bust, in glazed and bisque porcelain, circa 1940s- 50s. By the famous Herend Porcelain Manufacturer in Hungary. High quality vintage piece in excellent condition. $140.00 Lenin's bust in glazed porcelain, circa 1960s-70s. This large, 10" tall piece of very high quality was made by a factory in Socialist Hungary. In outstanding condition. $490.00 Lenin's bust, by unknown sculptor, dated 1925. This incredibly heavy, 14 lb solid bronze piece is a real enigma, and is one of the earliest busts of Lenin we have encountered. In good overall condition with some imperfections. $130.00 Lenin reading at a Bookcase, full statuette in Silumin alloy, 1970s-80s. Lenin appears tall and slender, almost like a professional athlete. $140.00 Lenin, full height, a standing statue in Silumin alloy, signed by the sculptor and dated 1977. Measures 14" tall. Excellent condition. $180.00 Lenin Resting in the countryside, statuette in silumin alloy. Shows Vladimir Illych sitting on a tree stump, probably in the spring or early fall. $145.00 "Springtime for Lenin" in Moscow, silumin alloy sculpture based on a May, 1919 photograph, 14" tall. Circa 1970s. $195.00 Lenin holding a book or a tablet, bronze plated statuette circa 1970s. $195.00 Lenin strolling with a little boy, a silumin alloy statue dated 1973, undoubtedly part of the Party's Cold War effort to cast the Great Leader as a grandfather type, concerned for the well being of children everywhere. $175.00 Solid Bronze Bust of Lenin on a Pedestal, dated 1955. Probably a replica of a specific shrine-like image once located somewhere in the former USSR. 8 5/8" tall. 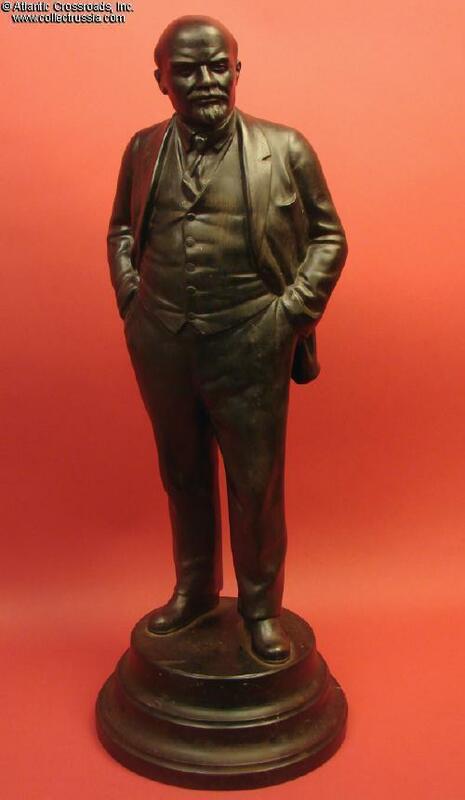 $790.00 Bust of Vladimir Ulyanov (Lenin) as a High School Student, massive 15" tall piece in cast iron. One of the most uncommon and finest busts of Lenin we have ever handled. Shows Kasli foundry mark and a 1964 date of manufacture. A superb piece. $115.00 Lenin in Grade School, Leningrad Porcelain Factory (Lomonosov), 1950s-1960s, 5 1/2" (140mm) tall. Excellent execution and a very good likeness. $125.00 Lenin With a Book, 3 / 4 length statuette in Silumin alloy, 1970s-80s. Measures over 11" tall. In excellent condition. $180.00 Lenin's bust in silumin alloy, circa 1970s, with inscribed presentation to workers of the vegetable growing collective farm. $150.00 Lenin, 3/4 length statuette in Silumin alloy, dated 1977, by N. Teplov	Large size, about 12" tall. Very good to excellent condition. For more statuettes , please visit the Soviet Statuettes & Busts in Metal, section of our website. $195.00 Lenin bust, in glazed and bisque porcelain, circa 1970s-80s. By the famous Herend Porcelain Manufacturer in Hungary. In excellent condition. $420.00 Lenin's bust, magnificent limited edition bronze by the RSFSR Arts Fund factory, dated 1958.The original artwork was created by sculptor A.S. Rabin. Very impressive piece in excellent condition. $95.00 Lenin Bust by sculptor Strelyaev, dated 1976. A very impressive 13" tall, 11 " wide rendition molded in resin with high quality bronze finish applied to create full impression of solid bronze. Easy to carry and display, this piece costs just a small fraction of a similarly sized bust cast in bronze or iron. In excellent condition. $120.00 Lenin Bust, Silumin alloy with bronze finish, dated 1980. Medium size, would make an impressive display on a book shelf. In very good to excellent condition. $80.00 Lenin's bust in bronze painted aluminum alloy, by Sychev, circa 1970s-80s. Better quality, 6" rendition with a lot of character. $80.00 Lenin's bust in Silumin alloy, circa 1970s-80s. An uncommon gloomy facial expression. In excellent condition. $145.00 Lenin bust in Silumin alloy, dated 1980. By sculptor A. Murzin. $250.00 Stalin Bas-Relief in Solid Bronze, circa late 1930s. Massive and very well made piece in excellent condition. $370.00 Large and Massive Cast Iron Bas-Relief Portrait of Stalin, circa 1939-41, probably intended for display on the wall of an office or perhaps on the front of a public building. 9.5" in diameter with raised portions ¾" inch high at their widest. Kamensk, Ural foundry marked piece in outstanding condition. $85.00 Round wall-plaque with sculptured profile of Stalin, late 1940s through mid 1950s. Shows Stalin in Generalissimo uniform with Gold Star "Hammer and Sickle" award. $195.00 Wall-plaque with Stalin's bas-relief, circa 1950s	Shows appliqué Stalin's facsimile signature in bronze by the acclaimed Soviet artist Nikloay Sokolov. $195.00 Round wall-plaque with sculptured profile of Stalin, late 1940s through mid 50s. Brass, white porcelain. Limited edition produced at the state mint. $120.00 Etched counter-relief of Lenin on a Crystal Disc, circa early 1970s. This highly unusual limited edition paperweight can serve as a nice display piece. In very good to excellent condition. $75.00 Desktop plaque with sculptured profile of Lenin, circa 1970s. $80.00 Lenin Bas-relief Wall Plaque in bisque porcelain, by the Lomonosov Porcelain Factory (LFZ), Leningrad, circa 1960s. Relatively early piece in very good to excellent condition. $50.00 Lenin brass bas-relief for a personal folio or presentation plaque, circa 1950s-60s. Very professionally made.